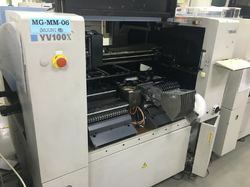 Offering you a complete choice of products which include 6 head vision smt pick and place machine, 4 head vision smt pick and place machine and yamaha smt pick and place machine-yv100-x (refurbished). We are a trustworthy organization affianced in offering a quality assured range of 6 Head Vision SMT Pick and Place Machine. At a top notch manufacturing unit, this product is designed by using well tested raw material and latest technology. Besides, we provide this product in bulk quantity within promised time limit. Customers can avail these products at budget friendly prices from us. Platform, X, Y are used in Japan Panasonic servo motor drive and imported screw, ensure stability and accuracy. With the S-curve motion control, higher velocity. 6x High-Speed Placement heads, the use of closed-loop stepper motor system, hardware and software to detect motion, automatically compensates for motion error. The automatic machine vision MARK point positioning, high-speed precision. Built-in vacuum generator and breaking the vacuum device, pressure digitized detection, leakage reclaimer automatically fill admission. With a visual correction of camera array, a camera calibration 6 nozzle reclaimer angle and center. 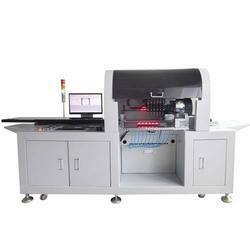 Support high-speed automatic pad scanning program, a few minutes to scan complete PCB board sheets. A 1-year warranty, completely remove the worries. With the help of diligent experts, we are able to bring forth a wide assortment of 4 Head Vision SMT Pick and Place Machine. These products are manufactured under the supervision of best industry expert as per set standards. Before final delivery, a team of quality examiners stringently check these items on varied parameters of quality, to ensure that offered product is free from defect. In addition to this, clients can avail these products from us in varied specifications in accordance with their needs. Platform, X, Y are used in Japan Panasonic servo motor drive, ensure stability and accuracy. With the S-curve transport control card, get a higher velocity. 4 xs for high-speed placement heads, the use of closed-loop stepper motor system, hardware and software to detect motion, automatically compensates for motion error. Automatic MARK point visual positioning, high-speed precision. Built-in vacuum generator and breaking the vacuum device, pressure digitized detection, leakage reclaimer, automatically fill admission. 1-year warranty, completely remove the worries. Maximum mounting data: 10000 mounting line/ 1 production data, Maximum 500 production data in the hard disk. Looking for LED Assembly Machine manufacturer ?